Interior Design 4 Edition For one/two-semester introductory courses in Interior Design. 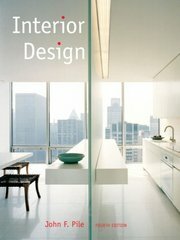 A comprehensive, applications-oriented introduction to the evolving field of interior design, with a focus on the challenges facing designers in the 21st century. Emphasizing good solutions to real problems by examining best practices from the past and present, the author details case studies using a broad range of projects from modest home and work-place designs, to public areas, to full professional involvement in large commercial spaces.